The day of February 7th, starting out as any other Friday. Went into work early and performed my daily duties for my company. Then I caught a cab to Chicago's Ohare to catch a 5:30 Flight from Chicago to Dallas which left late. As it was, I only had a half an hour to spare to catch my connecting flight from Dallas to Beaumont (TX), but I got to the gate too late. So American Airlines, my carrier, was generous to provide a nice hotel room for the night. But my problem was that Floyd had already left for the airport, which is about an hour and half from his home as Chester is not a large city. As you can guess dear readers, I was headed out his way to meet him and his family and see their crystal skull Windsong. So I had to wait patiently till the next morning to leave, but there was Floyd at the gate, just as he described himself and the adventure began. If you read the previous page about Windsong, you will see there is a reprint of an assortment of emails that Floyd and I have exchanged. Floyd told me that he was retired but had worked for the police department and was an ex-federal agent. Thus, he is one person I would never suspect would have an interest in a crystal skull. So besides seeing Windsong and having my own experiences with her, I was very intrigued to meet Floyd as well as his story is kind of unusual. However, if you review the stories of all the different crystal skull caretakers, you will see that each of these individuals is a unique person in their own right, so why should Floyd be different? Floyd had brought Windsong with him to the airport as he asked me before I came if I would like to hold her on the way to his home. I said of course, that would be a great honor for me. So he had Windsong in what appeared to be an army trunk and he took her out and gave the skull to me. So Windsong sat on my lap as we drove on to his house. Windsong is indeed a full size crystal skull, made from clear quartz crystal but has many inclusions inside of it. On the way to Floyd's home, I tried to explain to Floyd my understanding how the crystal skulls work with energy. What was interesting, is that I found while I was holding Windsong, that I had a great clarity of mind, and it was easy to speak simply on these subject matters so Floyd could understand me. Of course, one can say, holding such a large quartz can do this ... so I will continue with my experiences and let the reader decide if there is something more to Windsong than just a large crystal shaped in the approximation of a human skull. When we arrived at Floyd's home, I was greeted by his guard dog who stays outside (a very friendly dog she was) and then when I entered the home I met his wife and son (who was a computer technician and fixed all the problems on my notebook with Windows 95 -- what a blessing this was) as well as the rest of the dogs and one cat they had. Then I learned that Floyd was a civil war collector. Floyd showed me the coat of Robert E. Lee's son and an authenticate pistol plus I got to sleep in the Confederate Room also surrounded by actual artifacts from the civil war and replicas (... which was interesting to me as I believe I had a past life at this time, except on the Union side ... when I was young I was fascinated with this time and had my own civil war army men...). After a wonderful lunch provided by Barbara, Floyd's wife, ... we sat and talked about crystal skulls at their dinning room table. I shared with the Petri's my photo albums of different crystal skulls and we viewed some of the video tapes I had collected. During the afternoon, we conducted a short ceremony with Windsong where we shared her with the six directions and four elements and then I visualized the other crystal skulls I have seen before, and tried to link Windsong with them. I felt a strong energy inside of me while I was doing this, but this is nothing new for me as this happens with most crystal skulls. My general feeling with Windsong during the time I was around her was that her energy was very calm and peaceful. With some crystal skulls I have seen, I can feel an energy or power that can almost knock you over but with Windsong, she was very quiet. Not quiet like she had no energy but just very soothing and relaxing. With each new crystal skull I see, I like to have a private session to just sit with the crystal skull and see what comes up. I try to be spontaneous and not control any specific direction. Lately I have found that I do my best work when I am listening to music so I put on my earphones and listened to some Genesis, a group that makes my heart sing. First I just tried to link into the energy or essence of the skull and at one moment I felt an energy of utter joy go through my being ... During this time, I really tried to communicate with the being that is Windsong but I did not receive a mental impression or connection with a specific being or entity. Floyd's proof for the existence of a spiritual entity working through the crystal skull was an aura picture taken with Windsong using one of the new aura cameras. I did see this picture and in it, you see what appears to be an energy field around Windsong (as the area around the skull is quite foggy) and sitting on the top of Windsong head is a pink-purple light which then reappears in the same image off to the skull's left in the air ... I have never heard of doing an aura picture just with a quartz crystal but certainly this picture was showing some type of energy around the skull. a circular protrusion in back. 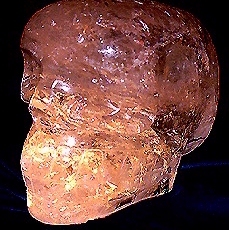 The sensitives that Floyd had worked with Windsong before claimed that this crystal skull was made in the late 18th century by a blind craftsmen in the Amazon. Upon gazing at the eyes of Windsong, they are not as deeply cut into the quartz as most of the other crystal skulls I have seen and the eyes were shaped more as a slanted depression (sort of like an oriental eye is). It gave me the feeling of looking at a blind person ... and a feeling that as Windsong becomes more activated, perhaps the eyes would open up ... this impression could also be due to the way that the quartz appears behind the eyes as it is very cloudy. I counted 28 teeth all the way around the skull. Even though the teeth are not very detailed as compared to other crystal skulls, there still was more than just a line cut into the crystal. 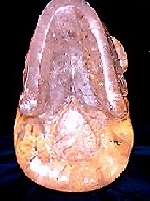 Each tooth had sort of a square pattern with rounded corners at the top with the impression of protruding out of the quartz. For the nose, there is a good approximation of nostrils underneath as there is a nice indentation underneath the nose. Windsong has a very short and high carved cheek bone which kind of protudes out of the skull and is circular in the back. Under the jaw is a nicely carved jaw bone with a rounded piece at the back of the head protuding out (see picture on the viewer's right). Impressions upon working with Windsong: The first image I saw and felt upon feeling the energy of Windsong was a ray of light from my left eye moving into the corner of Windsong's left eye by the nose and feeling a connection inside the crystal skull at its center. Again, I felt a very calming energy connected with Windsong and felt a strong connection (as if the left side of my body becamed balance) when I touched Windsong behind its right cheekbone, high up on the side of the skull. In all my time with Windsong, if a spiritual entity existed with her, this one point on the skull felt the best as it seemed as if I was merging with some type of presence ... the energy felt warm. When I tried to contact the essence of Windsong, I felt an energy go through my ears as if I was in a place where there was no sound. When I looked at the face of the skull, I heard "Jungle" and felt like through Windsong's face I could see the face of the person who fashioned the skull. 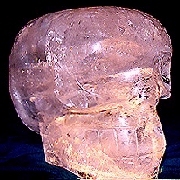 I sensed also that connected with the crystal skull were two different consciousnesses, one that belonged to the quartz crystal itself and another that worked through the skull. As our readers know ... I have had visions of a Blue Crystal Skull recently so when I brought in the energy of this skull, it seemed to activate the front part of the head of Windsong, where the brain is located. This inspired me to want to focus on the brain section and try to clear the quartz ... (Note: -- we did a video interview with Floyd on Sunday as well as some video of Windsong using a light source from underneath and we thought that Windsong in the video looked a bit more clear). Lastly, I found myself wanting to allow my hands to make circular motions from the jaw to the top part of the skull and this felt very comfortable. My Conclusions: I do not feel Windsong is what we call an ancient crystal skull but there is a very calming, healing energy connected with this crystal. I can not explain the aura photo I saw but I found my hosts Floyd & Barbara Petri to very friendly down to earth people and based on some of the other experiences the Floyds had during my visit, I do believe that something has activated this crystal to allow other positive energies to come through to be shared with others. I would suggest, that if people have a chance to have their own experience with Windsong, and people feel an affinity to do so, to follow their intuition and make an appointment. As the Floyds start to share Windsong with other people it will be interesting to hear what experiences other people have. I heard from Floyd how Windsong will change at times, becoming more clearer. I have in my notes that Charles commented how he saw Windsong become more clear after we did our ceremony. I can not make comment on this, since this is the first time I had seen Windsong so it would be hard for me to notice such changes. Barbara also mentioned that their cat likes to sleep around Windsong, when the crystal skull is left out at night and that some of the children form their relatives who have visited them at times, have been interested in Windsong as well.  So it appeared from my observations of the family that the presence of Windsong in their home has been very uplifting. Another synchroncity that came up during the weekend is how people visualize in their mind what Windsong looks like, this spiritual being with the crystal skull. Since I have been talking to Floyd about the crystal skull, I have always seen in my mind an adult women. In the car on the way to Floyd's house from the airport, he said he saw her in his mind as a little girl. I told Floyd I know he is frustrated not being able to communicate with Windsong but if he would just trust his imagination perhaps mentally Windsong would communicate with him in that way. Before I left to return to Chicago, Floyd permitted me to not interview him on video but also gave me permission to take some slides and pictures of Windsong. I feel from viewing the pictures of Windsong that the skull seemed to like the light source we placed under her and suggested to Floyd to experiment in the future with different color lights as has been done with other crystal skulls. Also I was surprised when Floyd said that he was willing to sell his collection of Confederate artifacts from the Civil War ... in order to buy more crystal skulls ... so if anyone is in touch with a collector and would like to help Floyd increase his collection, please let him know. Floyd is happy to permit other people to visit their home to experience Windsong. It just requires an appointment. For information on how to contact please click here. Also Windsong had an opportunity to visit with "MAX", the Texas Crystal Skull in Houston, on February 20th, and Floyd had a wonderful visit with the Parks, "MAX"'s caretakers. We are happy to see that the crystal skulls are beginning to get together. Last note on the weekend -- as Floyd mentioned in his emails on the other page, he started a UFO organization for scientific research of UFOs quite a number of years ago. He had one UFO sighting that was quite profound, that I would like to briefly mention here. This sighting happened in Redrock, Texas about 7 years ago (1989?). Floyd had been using a laser beam to send messages to the UFOs and one craft showed up and came down as close to 1000 feet (he estimates) from them (his wife and son were also present). Floyd showed me some pictures of this UFO of which most of them were not too clear. However, in one picture you could clearly see a circular disk with three legs. When the UFO showed up, the tried calling by phone other people involved in their UFO organization, to let them know but the whole phone system went out and their mobile phone was making a strange beeping sound, not a normal sound at all. He taped recorded their live report of this experience and you can hear the phone beeping in the background as if someone was trying to send a message in code. Even after they turned the phone off, disconnected the battery, it still made this sound. The ship stayed in the sky for a good length of time. When it left, Barbara almost passed out and was sick to her stomach and their son had some pain in their head. Floyd believes they received a short dose of radiation and this wore off after a time. So dear friends, it was a short weekend but I am very glad to have met the Petris and Windsong. Floyd and I are talking about possibly working together in the future, to combine the opportunity to experience Windsong with a crystal skull and a UFO talk. We will let you know if something comes up and certainly we are open to visit other places if invited.